Love your pet rabbit and give them lots of bunny treats and hugs. The best wool comes from happy bunnies. Rabbits are sensitive to some household irritants. If you smoke, for example, you should do it outside. The angora rabbit is a beautiful, sweet-natured animal with a soft coat. Angora rabbit wool has been used for everything from scarves to sweaters and for centuries has been a prized material in the world of clothing design. Having a pet angora rabbit is rewarding in so many ways. In addition to being incredibly hug-able, you can also turn a profit by owning an angora rabbit. Get a baby angora rabbit from a reputable and trusted breeder. Be wary of backyard breeders who typically line breed their animals. Line breeding can cause congenital defects in animals and can cut both lifespan and quality of life for your rabbit. Make sure to secure your home and tape down any dangling wires or dangerous things your baby rabbit could chew on. Also, get a suitable cage for when you are not able to supervise your rabbit. Start to train your baby rabbit to be handled and to use the litter box appropriately. Using a litter box with recycled paper litter can cut back on urine stains in the rabbit's hair and is also just a well-mannered thing to teach your pet. Hold your rabbit often, several times a day and earn it's trust. Touch the rabbit's feet, hindquarters, ears, face and belly to get her used to being groomed and handled. 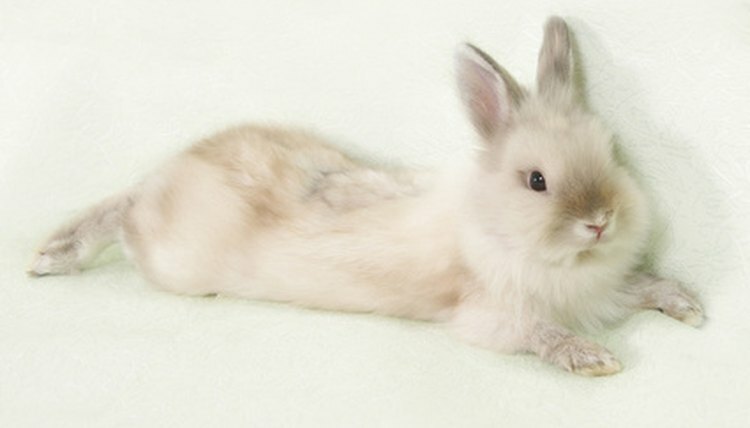 Take a slicker brush and brush your rabbit's hair several times a day in a calm gentle motion. Then comb out the hair again with an undercoat rake. Each time you brush or rake your rabbit's coat, save the hair from the brush and put it into a clean cloth bag. Apply dry bunny shampoo to your rabbit twice a week to make brushing easier and keep mats from forming. This also keeps the shafts of the hair clean and dry so that it can be used to make angora yarn. Take the sheers and carefully begin to sheer off the rabbit's hair from the nape of neck down to the tail. Do this until all hair on the trunk of the body is only 1/2 an inch long. If you are uncomfortable with sheering your angora, you can hire a professional groomer. You can sheer your rabbit twice a year during a molting. You will know your rabbit is molting when they begin to shed more hair than usual when you brush them. You can also choose to pluck the hair from your rabbit rather than sheer it but this should be done with reserve until you become a very experienced rabbit handler. Call yarn shops and ask if they'd like to buy pure angora hair for yarn. Often, small yarn shops will purchase directly from pet owners and spin the hair into skeins of yarn to sell to customers. Make a listing on an online auction site and try to sell your rabbit hair to suppliers. Such sites can be a great tool to search the current price of angora hair as well. Take time to learn to spin your own yarn for maximum profits from your rabbit's hair. You can spin right off a rabbit sitting in your lap if they are in a molt at the time. You can practice this by putting your rabbit in your lap and plucking slowly at the dense undercoat, lifting fibers into your thumb and forefinger. Gently twist the fibers and pluck more undercoat as you twist. Twist it tightly but do not tangle the fibers. You can then wrap the yarn you've spun into a skein and sell it directly to knitters. Can I Make Yarn From Pet Hair?